Sovon, a Dutch bird protection organisation, counts birds. The number of greylag geese is increasing. Is this increase worrying for the diversity of water bird species? What does the concept biodiversity mean, how can it be described mathematically and what are itsadvantages and limitations? 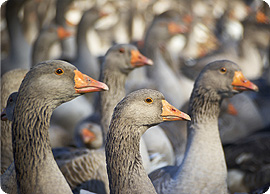 In this activity students will explore the evolution of a population of geese in the Netherlands. Students will learn both about the meaning of biodiversity and how it can be measured. As a final product students will write a report to the bird counters of the Sovon organisation in which they explain their findings and offer advice. Biodiversity: what does it mean and how can it be affected?